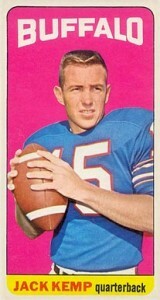 The 1965 Topps Football card set is one of the most classic sets of all time. Two factors contribute to this: its off-beat design and it includes one the most iconic cards in the hobby. 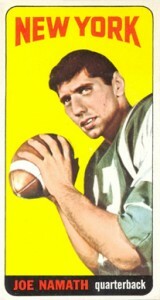 The 1965 Topps Joe Namath rookie card (#122) ranks among the hobby elite regardless of sport. Frequently referred to as Tall Boys, the cards measure 2-1/2 by 4-11/16 inches. In addition to the Namath, other Hall of Fame rookies include Willie Brown (#46) and Fred Biletnikoff (#133). Other rookies appearing in the set are Pete Gogolak (#30), Winston Hill (#116), John Huarte (#117) and Ben Davidson (#137). The set boasts several eventual Hall of Fame players as well like Nick Buoniconti (#3), George Blanda (#69), Bobby Bell (#91), Buck Buchanan (#94), Len Dawson (#99), Don Maynard (#121), Jim Otto (#145), Lance Alworth (#155) and Ron Mix (#168). The front of the cards feature a large player photo superimposed in front of a vibrant, solid-colored background that's either red, green, yellow, blue or pink. The team city appears above the player, while his name and position appear in a contrasting colored banner along the bottom, below his picture. A white border surrounds the card. Card backs are divided into two distinct parts. The right side features a cartoon about the player. 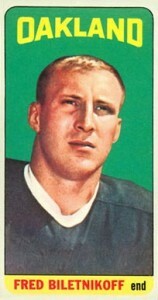 The left side starts with a black box with a football-shaped holder for the card number, along with the player's name, position and team. Two lines of vital stats and a biography follow, along with a year/lifetime statistics box for certain players. Following the same numbering schematic they utilized in other Topps' AFL-only sets, every team is grouped together numerically. Their order in the set is arranged alphabetically by city. Within each team, players are grouped alphabetically by last name. 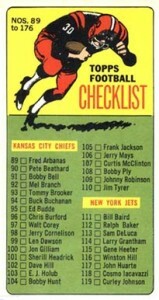 There are also two checklist cards (cards 87 and 176). One of the puzzling things about the 1965 Topps Football card set is the manner in which the cards were laid out on the printing sheets. With a checklist of 176 total cards, 132 of them are considered short prints. Conversely, you could also say that 44 of the cards were double-printed. It is believed that the cards were arranged in nine rows of 11 cards. Cards were sold in traditional five-cent wax packs as well as cellos. In addition to the cards and customary gum, packs contained one Magic Rub-off sticker. The sticker set consists of 36 total stickers divided between eight AFL teams and 28 college teams. 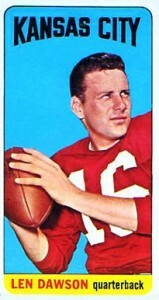 Cards from 1965 Topps Football are frequently found with centering issues. This is a result of the contrasting color background and the thin white border, which makes the issue more pronounced. The larger size of the cards makes them susceptible to damage from wear and tear, which is noticeable on corners and edges. The unique size of the cards also makes print flaws stand out more distinctly.